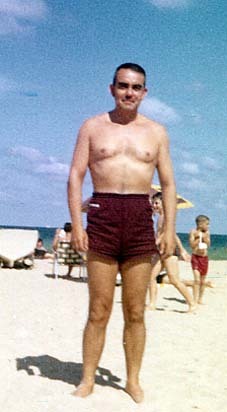 1961 Dad's second favorite sport - the beach - kept him in good form. 1961 Paco's Chevy wagon parked next to the family home at 2820 Columbus Blvd. 1961 All together now, in the backyard of 2820 Columbus Blvd. 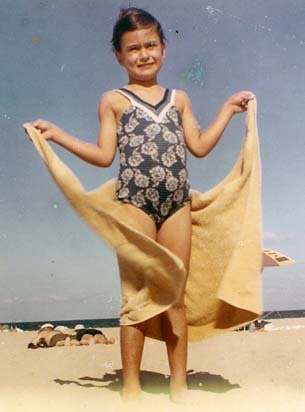 The Colombian-born generation are in back; the U.S. generation, Racine, WI and Miami, FL, make up the front..
1961 It's Constanza, at six, showing off her beachwear. 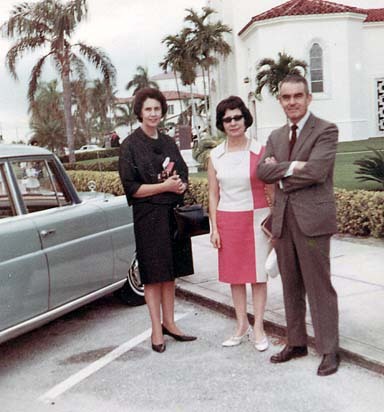 1961 Mom and Dad and Colombian neighbor, stand in front of Dad's blue Mercedes and in the background, St. Theresa's Church of the Little Flower, just a few blocks from home. 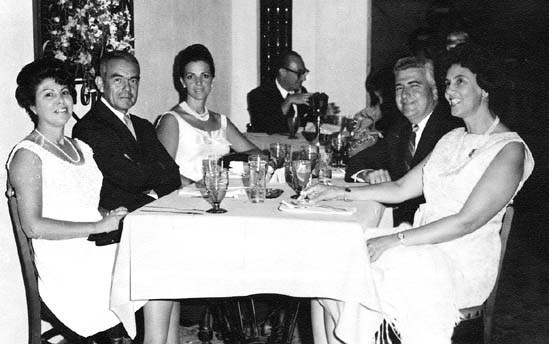 1961 Mom and Dad dine Bogotá-style. 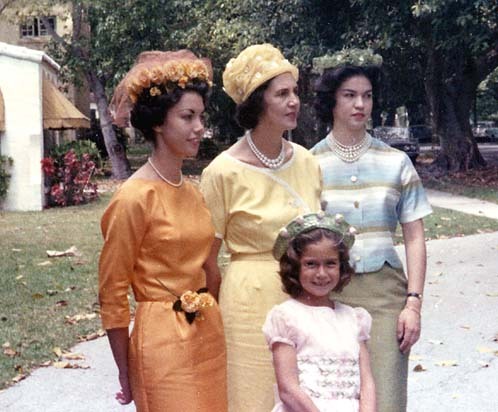 L-R: Cecilia Cano, Paco, the reigning Miss Colombia, Luis Gabriel Cano and Aura. 1962 Stepping out on Easter Sunday in our new outfits and hats crafted by Mom. 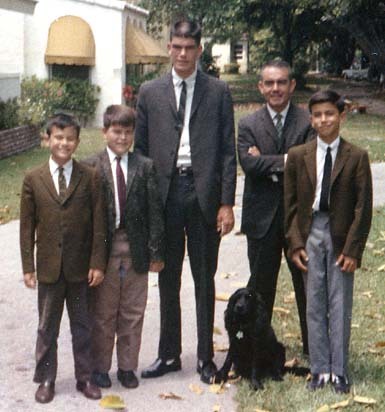 1962 Danny, Gabriel Cano, Mauricio, Dad, Edgar and Lucky dog-2820 Columbus Blvd. 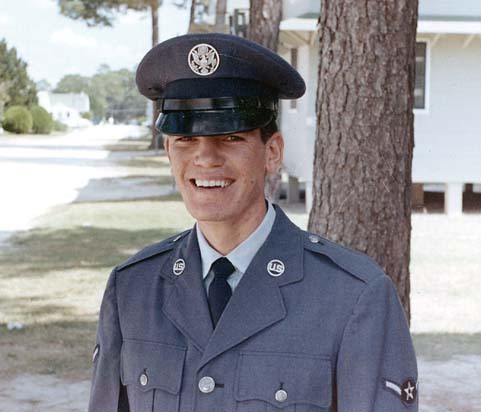 1962 Mauricio joins the Air Force and is stationed in Biloxi, Mississippi, before moving on to Hamilton in San Francisco, and then Mt. Laguna, east of San Diego. 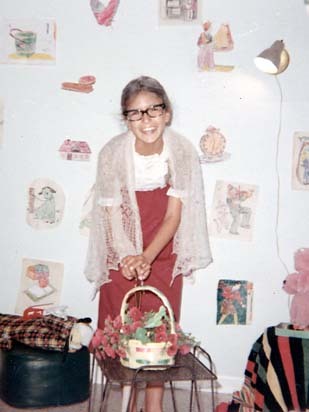 1963 It's "Granny" Constanza with a wall display of her art. Cool shades! 1963 Edgar, 12, the Racine, Wisconsin native, looking sharp! 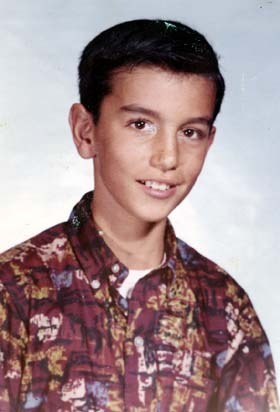 1963 Not to be outdone by his older bro, Danny's looking good at 10. He and Constanza were born in Miami. 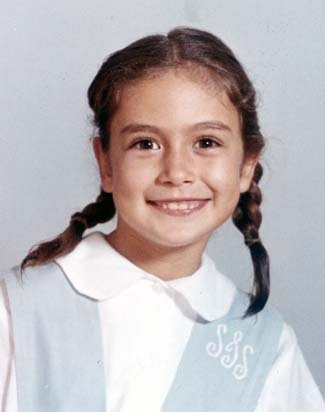 1963 Constanza, ready for class in her St. Theresa School uniform. 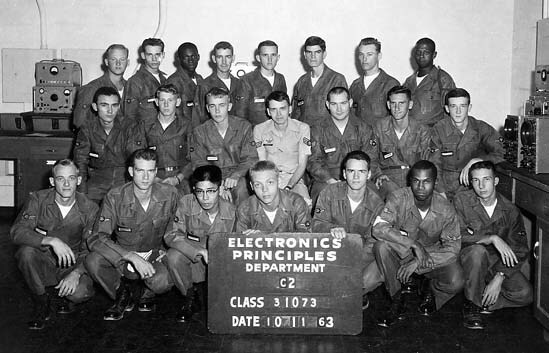 1963 Mauricio (3rd from left, back row) in one of his classes, during his 4 yr. stint with the Air Force. 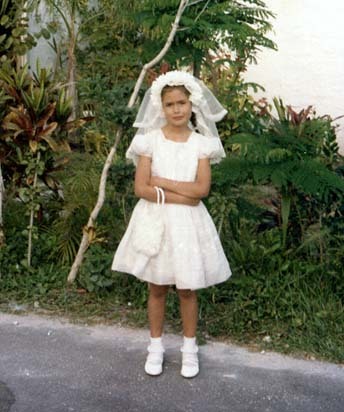 1963 First Communion Day for Constanza at St. Theresa School. 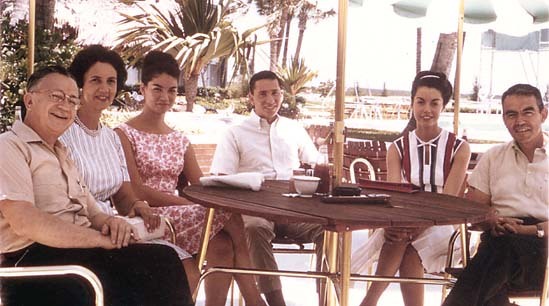 1963 Mom, Dad, Cristina and Victoria visit with David Arroyo and Ricky, his son. Paco, Aura and the Arroyos were married at about the same time, and the four honeymooned together traveling in a 1930's roadster, through various small Colombian towns. 1963 Cecilia and Luis Gabriel Cano and daughter Patricia; Danny in the background. 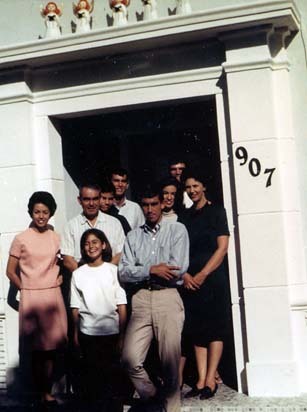 The Canos, close family friends, lived nearby in the Gables for many years before returning to Bogotá. 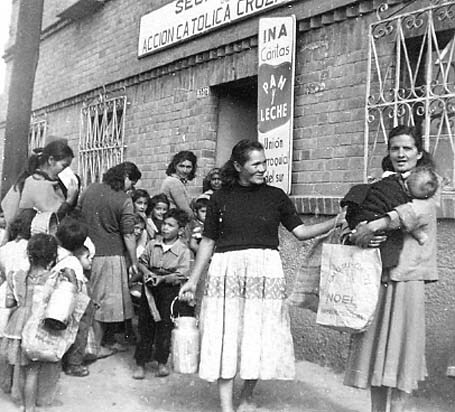 1963 During one of her visits to Bogotá, Victoria helped in a social outreach program and school, teaching and distributing food for the needy families in a small village. 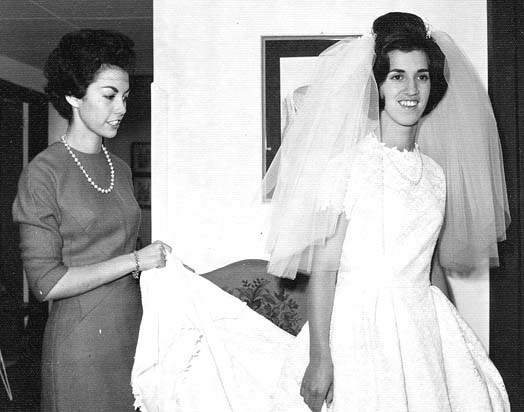 1963 Victoria, a house guest of the Vilas family in Bogotá, attended their oldest daughter Maria Lucia's wedding. 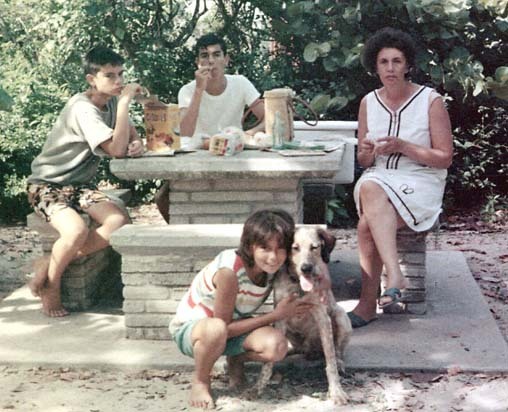 1965 Picnics in the park, across from the beach in Ft. Lauderdale, were always tasty. Danny and Edgar sit with Mom, and Constanza pats the new Montana pooch. 1965 It's Christmastime in front of 907 Valencia. The angels at the top were part of the traditional decor. 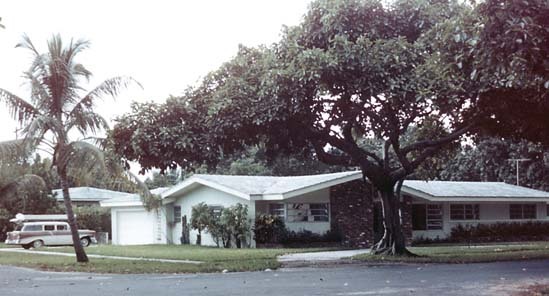 This is the last home we lived in built by Dad in Coral Gables. 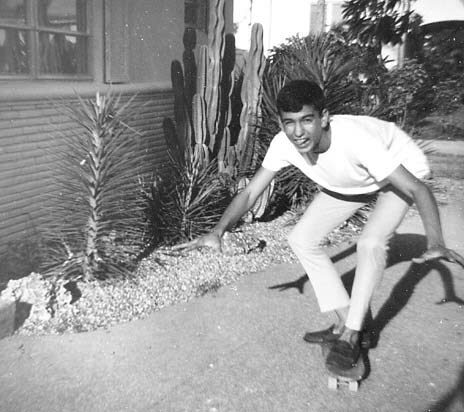 1965 Edgar, sporting his "mean" look, while skateboarding on the circular driveway at 907 Valencia. 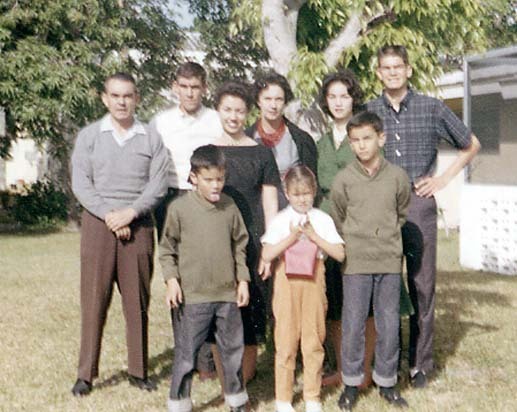 1965 Mom and Cecilia Cano in front of the Canos' home in Guatavita, Colombia. 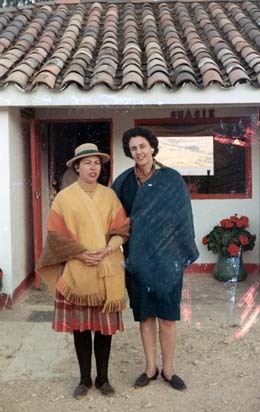 Both of them wear the traditional ruanas. 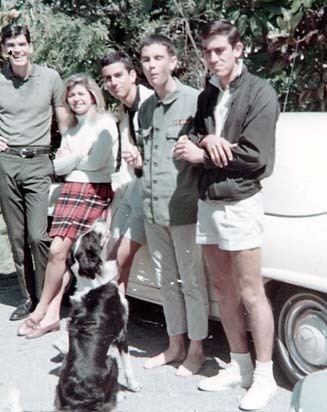 1965 The four Montana boys L-R: Mauricio and friend , Edgar, Danny, Pacho in front of Dad's latest sports car. 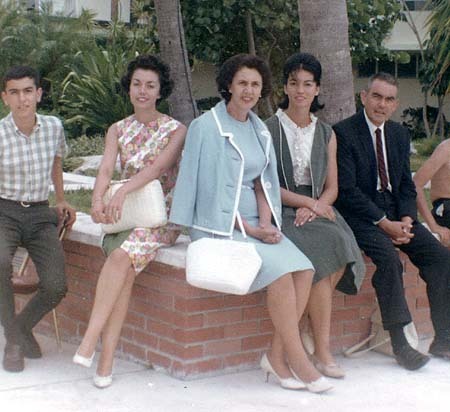 1965 L-R: Edgar, Victoria, Mom, Cristina and Dad under the palms in Coral Gables. 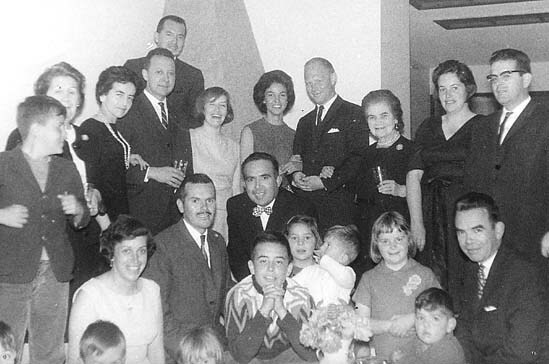 1965 The Montana aunts, uncles and cousins celebrate in Bogotá. 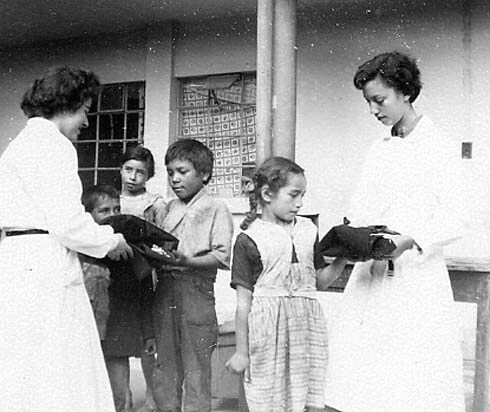 Mama Carmelita, (3rd from right) loved parties, especially if they included a hot game of Toruro, her favorite card game. 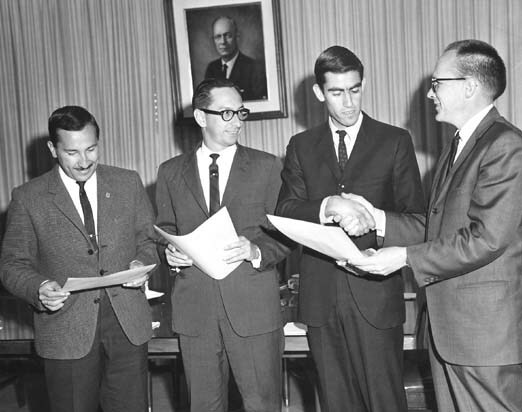 1965 Pacho receives a journalism certificate. He studied at the University of Florida at Gainesville.